Soda sales have been flattening, but the industry has stepped up marketing and lobbying, according to Marion Nestle in Soda Politics: Taking on Big Soda (And Winning). Ever wondered how a few companies — namely Coca-Cola and PesiCo — created multibillion-dollar empires marketing flavored sugar water? Nutrition scholar Marion Nestle, one of the most dogged chroniclers of the U.S. food industry and its politics, did. She was intrigued by the power of Big Soda and how it's responding to flat sales in the U.S.
And in her latest tome, the 508-page Soda Politics: Taking On Big Soda (And Winning), she deconstructs the industry's playbook. From its brilliant use of marketing and public relations to its political maneuvering, Nestle reveals many of the ways these companies have endeavored to "protect sales and profits at the expense of public health." Nestle's position on soda is clear and based on hundreds of scientific studies: It's unhealthful. She saw a big-time need for more advocacy against soda consumption and not enough resources for advocates. So she set out to outline what is working in the fight against Big Soda. We spoke to her at length about her research and the conclusions in her book. The conversation has been edited for length and clarity. You make the case in your new book that Big Soda has borrowed from the playbook of Big Tobacco. What are some examples of that? The first thing [the industry] did was to attack the science. That's what the cigarette industry did, and that's what the producer of any unhealthful product does. You cast doubt on the science, and then you pay for your own science. You fund investigators who you are pretty sure are going to produce research that will show that your product isn't harmful. And that's exactly what the soda industry has done. And while you're doing that, you advertise, of course, and your advertising is aimed at deflecting attention from the harm that your product might be causing to health. In the case of soda, the advertising is aimed at physical activity and hydration. You need to drink, so drink our product. It's not our calories that are causing problems. Of course, Big Soda did come under very high-profile scrutiny for its tactic of funding scientists who have already done research focusing on calorie expenditure. Yes, this was the Global Energy Balance Network funded by Coca-Cola, as the New York Times reported. And this was funding of investigators who formed this organization to not only promote physical activity, but also with the message that it doesn't matter what you eat or drink, it's physical activity that counts. What are your thoughts on how Coca-Cola responded to the Times' revelations? It was a huge public relations disaster for Coca-Cola. People were shocked by it. [My] book wasn't out yet, but people were astonished that Coca-Cola would fund research in its own interest in so blatant a way. They eventually published a list of all the organizations and individuals who took money from them. It's an astonishing list. One of the things that has happened since then is that Coca-Cola has pulled out of some of the more controversial groups, like the American Academy of Pediatrics and the Academy of Nutrition & Dietetics — or those groups pulled out of Coca-Cola funding. As we've reported, the World Health Organization and other health agencies have recommended limiting sugar to no more than 5 to 10 percent of your daily calories. A typical soda gets you there quickly, right? If you have a 12-ounce soda, it has 10 packets of sugar dissolved in there. You have to think of these things as liquid candy. One 16-ounce soda is the upper limit of sugars that anybody should have in a given day. So unless you're drinking these things in very small amounts, you shouldn't be drinking them at all. 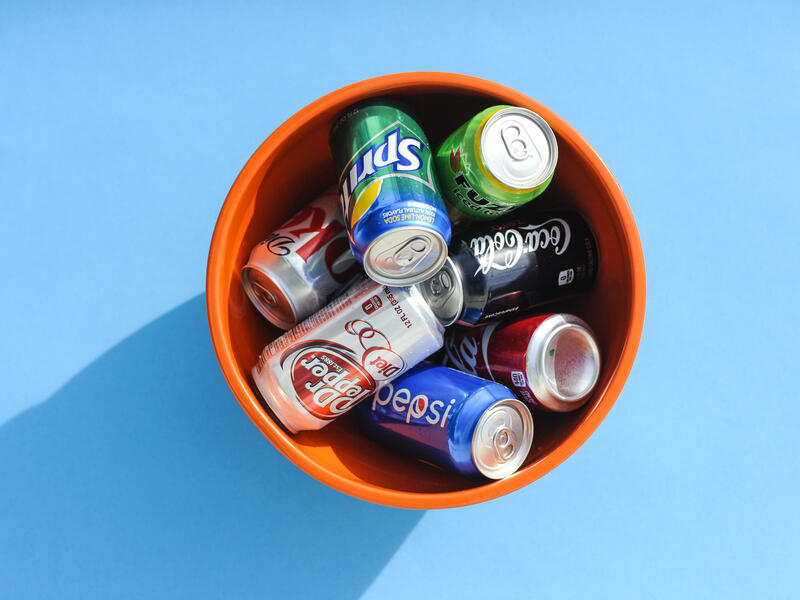 As public awareness about how much sugar is in soda has caught on, we see that people, especially teens, are still drinking plenty of other sugar-sweetened beverages, like teas or energy drinks, that have just as much sugar as soda. What do we do about that? I wrote a chapter in the book about how to teach your kids how to do soda advocacy. The first thing you do is, once the kids are literate and can read, is to have the kids read the labels and look at how much sugar there is in them. And if they see that the amounts of sugar are similar, maybe they won't drink them. Do you think people have held on to Coca-Cola emotionally because they associate Coca-Cola with the Olympics, with Santa Claus? I'm just back from a visit to the World of Coca-Cola in Atlanta. And the first thing you do, you go in and watch a video that's so touching. There wasn't a dry eye in the house, including mine. It was just extraordinarily touching. The whole experience being there — the tour, tasting 50 different kinds of Coca-Cola products, the videos, the gift shop, the photos — was very powerful. I ended up coming out of it thinking that this company is Dr. Jekyll and Mr. Hyde. On the one hand, you have Dr. Jekyll dealing with all the best aspects of America: happiness, patriotism, honoring our sports and music figures. On the other side, you have Mr. Hyde, the evil twin behind all of this, making every single one of these decisions totally strategically. He's saying, How can we best market this product? How can we give money to community organizations so they won't criticize us and won't talk about how bad sodas are for health? How do we fight soda taxes and fund researchers in ways that won't get us into trouble and will give us the research answers that we want? What about the people fighting for health from the inside? You have a chapter about Dr. Derek Yach, a well-known public health scholar who went to work for PepsiCo. If you're working from the inside, you're working for the company's interests. If the company is publicly traded and has stockholders, it has one purpose and one purpose only: to make money for stockholders. That's what you're up against. If you can come up with a healthy idea that will make money for the company, that's fine, but those are hard to come by. One of [my] take-home lessons from tasting 50 different kinds of Coca-Cola products is that regular Coca-Cola tastes better than any of them. I thought, "Oh, my goodness, this company has a problem." Coca-Cola tastes better than any of the other drinks. They can sell more bottled water and other things, but don't make as much money on them as they do on the sugary soda. You outline some of the ways public health is winning. And as we've reported, studies show that one way to get people to reduce their soda consumption is to tell them how many miles they'd have to run or walk to burn off the calories in a soda. New York City put up posters to this effect, yes? The New York City Health Department has been really vigorous about the health of New Yorkers and trying to reduce the prevalence of obesity and its associated type-2 diabetes. A few years ago, they started on an educational campaign to reduce soda consumption. The posters that were around for a few years helped to prepare the city's attempts to try and tax sugar drinks and cap the size of them. And even though neither of those regulatory iniatitives passed, they certainly raised awareness. You need both regulation and awareness in order to make real change. What do you expect to see from the soda industry in 20 years? Will we be fighting the same battles? My impression is it's a Dr. Jekyll and Mr. Hyde battle [inside these companies]. The Dr. Jekylls at the soda companies want healthier and smaller products. They are in favor of public health. The real question is, what are the Mr. Hydes going to be doing? Because those are the people you really need to worry about. They're the ones who have their eye on the bottom line all the time. And they're not letting Dr. Jekyll do what he wants to do for public health. The big beverage companies have set a goal to reduce beverage calories consumed per person nationally by 20 percent by 2025. What do you think about these pledges? A lot more marketing is being directed toward small cans. I think they're a step forward. If they can make as much money selling [smaller servings of soda], they would be happy to do it. It's part of their strategy, as well as diversifying with water and other drinks. But the money is in the full-sugar sodas at the moment. I think there will be continued pressure on them to [sell them] in a way that's healthier.